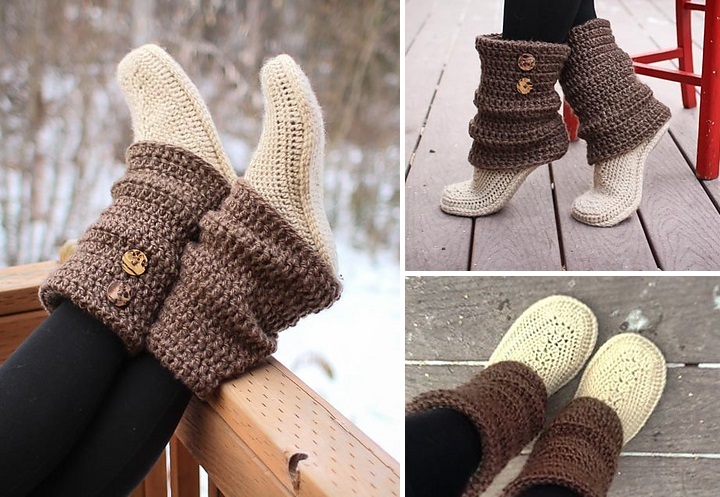 If you like to cozy up to a crochet project when the weather turns chilly, then a pretty pair of crochet boots is the perfect project for a winter evening by the fire or with a piping hot mug of your favorite warm beverage. The Audrey Boots from Mamachee on Ravelry are adorable, especially with the two-tone coloring. These would make a great gift for tweens, teens, and adults, as house slippers or dorm shoes. Pair them with some thick wool socks and everybody’s toes will remain toasty throughout the winter season. You’ll need bulky yarn (suggested: Lion Brand Jiffy Solid), two sizes of crochet hooks (sizes “I” and “L”), scissors, and a tapestry needle. You’ll also want to crochet a gauge swatch of seven stitches and four rows, which should equal about two inches. If you want to add some detail, a few buttons can be sewn on after the boots are complete. The pattern comes in Women’s sizes 3-4, 5-6, 7-8, and 9-10. The Audrey Boots pattern can be purchased on Ravelry as a PDF. However, if you’d prefer to use a free pattern, there are several to choose from on Pinterest as well as Ravelry. We found a pattern for re-using flip-flop soles to create a more durable boot at the Make & Do Crew, who not only provided a photo tutorial, but a video tutorial as well. Their pattern calls for Lion Brand Wool-Ease Thick & Quick yarn, Vanna’s Choice yarn, three sizes of hooks (“B”, “K”, & “L”), a tapestry needle, a sharp tool, stitch markers, buttons, thread, a ruler, glue, and scissors. There’s also a free pattern for slipper boots from Yarn Inspirations that come in sizes for the entire family (suggested yarn: Bernat Softee Chunky). You’ll also want to crochet a gauge swatch of ten stitches and nine rows for a measurement of four inches with a “K” size hook. All of these patterns are listed as “Easy” so don’t let the look of the project intimidate you. These boots may take a little time to shape but the extra work is worth it, and you won’t have to learn any new, complicated stitches in order to make them. You will, however, impress everyone with your shoe-making abilities! If you want to purchase the Audrey Boots pattern from Mamachee, you can do so on her Ravelry page. If you’d like to try the flip-flop sole crochet boots, you can find the pattern and video tutorial at Make & Do Crew. And if you’re interested in crocheting several pair of easy-to-make boots for the family, Yarn Inspiration’s pattern is available as a PDF.